Basic cutting instrument used for surgical incisions. 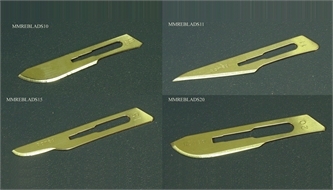 The interchangeable component of a scalpel. Martensitic steel (quenched, magnetic steel). Hardness: 50 to 58 HCR. The number indicates the shape of the blade. Individually wrapped in a reinforced laminated foil peel pack, sterile, single-use. Product name, size, reference number, expiry date, lot number, sterilization method, single-use, manufacturers name and address, and CE mark and reference number of notifying body. Must be multilingual: English, French and Spanish, others when available. Box of 100 units, cardboard, labelling is the same as unit presentation with total quantity. Complies with Medical Device Directive 93/42/EEC, class IIa or equivalent international standard. Complies with EN 27740/ ISO7740: Scalpels with detachable blades Fitting dimensions.